In Wednesday’s Sweet Apple Omelet recipe from Gina DePalma’s fabulous Dolce Italiano, a little thing called “grappa” was one of the ingredients — and one that I omitted. Since there is some mystery surrounding this peculiar clear bevanda, today we’re talking grappa, and our source will be none other than Gina DePalma, who was more than happy to answer questions about its use in her recipes. But first — what is it? We needn’t go further than Dolce Italiano for the answer. Have I mentioned that beyond a fabulous collection of recipes, Gina also offers an amazing amount of information on Italy, festivals and celebratory foods, the Italian language, and baking equipment and techniques? You can also learn the history of gelato, why you should always toast nuts before using them, how to test your oven’s prowess, and how to substitute different egg sizes in recipes. In a section called “Ten Italian Ingredients You Should Know,” Gina writes about “the building blocks of [her] dessert repertoire.” These are the essential items in her pantry at Babbo, she says, and grappa is on that list. An aquavite, or “water of life,” grappa is made by distilling grape skins and grape pomace, and this characteristic distinguishes it from other distillates made from wine or fruit….Grape pomace is essentially the leftovers of the winemaking process–the skins, pulp, and seeds. The pomace is heated in a still to produce an alcoholic mixture, which is distilled to remove the solids along with water, impurities, methyl alcohol, and any other volatile substances. The grappa is then carefully aged in a multistep process, which ends with a final reduction of alcohol and cold-filtering. Skilled, traditional grappa distillers produce a drink that is filled with nuance and flavor. 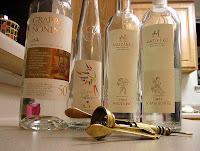 As every region produces wine, every region also produces grappa, but it is the northern versions that get the most accolades, particularly those from Friuli-Venezia Giulia and the Veneto. Which brings us to the Sweet Apple Omelet. As Gina pointed out in her email to me, the recipe itself comes from Friuli, and so grappa was a perfectly logical and tasty addition to it. I can certainly attest to that last part as sometimes it’s difficult to find a dessert here that *doesn’t* have some kind of alcohol in it — it’s even in children’s snacks! Here in the south where I am, grappa isn’t usually the addition of choice but there is a lot of rum, brandy, anisette, and even vincotto. All tasty to be sure. So why would you use grappa in a dessert recipe? From the book, Gina says that that “a truly fine grappa will accent and improve whatever flavor is highlighted on the plate.” She particularly likes using grappa in fresh fruit desserts and says that it is “heavenly when added to a crepe batter or lightly sweetened whipped cream.”And about her allegedly using excessive amounts of grappa in the recipes? “I think I use a good variety in the book — rum, amaretto, and grappa, mostly. I think that Americans see grappa as an unusual ingredient, and the recipes that use it have gotten more than their fair share of attention. But first and foremost, I use grappa in the recipes where it fits, either regionally, or because I think the flavor works really well.”So there you have it. 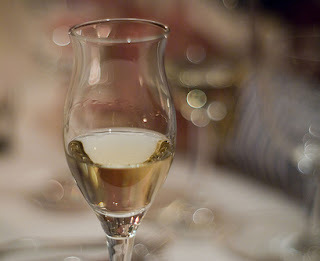 Now you know a little more about the mystical grappa, why Gina uses it, and why you should too. I do want to be clear that I didn’t use grappa in the Sweet Apple Omelet because I didn’t have any. I was sick over the weekend when I needed to shop for ingredients, and since I wasn’t going outside, this meant no grappa-shopping either. Related to that, even if I could’ve gotten my hands on some grappa (surely one of my neighbors has a stash, although it might be peperoncino-flavored! ), my recovering stomach was certainly not up for even the smell of it. Or at least I didn’t want to risk it. Next time I make the Sweet Apple Omelet though, I will certainly give the grappa a try in there. I trust Gina. And now my mom does too because she just received her Christmas gift from me in the mail yesterday — her very own copy of Dolce Italiano! The mailman actually delivered it *while* I was on the phone with her. It’s just the most wonderful time of the year, isn’t it? Ricotta Pound Cake & Sweet Apple Omelet, here! Best of luck and buon weekend! And I had to go over to Jen’s when I saw she had the “chocolate salami” recipe today, because my mom makes this every Christmas. It’s always fun to compare traditions, recipes and a lot of the cultural things between what you see in Italy and what I saw growing up in Portugal. I use a lot of liqueurs in dessert recipes, but there’s something about grappa that gives me an instant headache. I’m not sure why. This was a fascinating post, though! Thanks! I look forward to trying it in my baking. There certainly is a lot of it around here. Thanks for the information. One of my colleagues loves grappa. Wait there are recipes with amaretto in Gina’s book? Excellent. *Karina, I agree–it’s so fascinating to see things that cross cultures where you’d never imagine there’s overlap. *Alexmom, I’m sensing that you have something in particular in mind you’d like to see here. If only I could channel your thoughts…. *Jilli, I’m actually looking forward to it too. Now I have to buy some and get going on some more of Gina’s recipes! Next time in Italy I will have to try some grappa. Thanks for filling us in. The more you talk about the book I want it. I think the fact that is encompasses so much more than just recipes and speaks of the culture makes it so much more appealing. I’ve enjoyed all the recipes and I’m sure we’ll see more. My Mother in Law is Italian [but rarely drinks] I think I’d pass because like so many other recipes, you buy the bottle of whatever, use it once and then it gets buried at the back of the cupboard. I think I finally know what to do with the bottle of grappa on top of my fridge. *Lilian, ooh, I’ve never heard of that book; I’ll have to check it out! *Vicki, if you get a copy of Gina’s book, you’ll have *lots* of fun things to do with it! Ah! Grappa! A very strong drink indeed. I like a few drops in my espresso after dinner. The bottle does tend to last awhile in the house. I think it’s fun to watch someone taste it for the very first time haha. What can I say? I am easily amused.It is great in baking, just like the other liquors.This cookbook sounds fantastic! *Maryann, I couldn’t recommend this cookbook any higher; really it’s a must-have for those who love Italian desserts. *Shameless, well when you put it like that…. Call me dense, but I still don’t know how You feel about Grappa!